PVII Server Side Includes can be installed in Dreamweaver versions CS5.5 to CC 2015 (and later). Server-Side Includes allow you to manage repeating sections of your web pages in a central file. This page will help you to deploy your server side include. Server Side Includes are easy to master and can easily replace the need to use Dreamweaver Templates (DWT). To adapt your site to use SSI, you first need to make sure your server is set up to parse include files. If you do not know how to do this, contact your hosting company or server adminstrator. Tell them you need for ordinary .HTM and .HTML pages to parse server side includes. It is extremely easy to do on Unix, via your site's htaccess file. Windows hosts should also be able to set this up for you in a few minutes. If you manage your a dedicated server (Windows or Unix) please see this addendum. 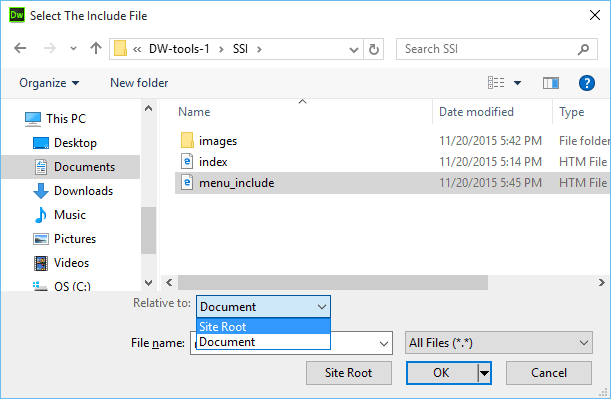 -Create a new file within the includes folder and name it menu_include.htm. -Find the menu markup and copy it. Include files must only contain the code you wish to appear in your actual web page. Your page already contains a DOCTYPE, an <html> tag, a <head> region and a <body> tag. You will remove all of this code and replace it with the menu markup you copied from your actual page. Your menu markup replaces the original page code. -In menu_include.htm, Select a menu item. The Insert Server Side Include dialog will open. -Click the Browse icon to browse to your include file. -If you need to use a Vrtual include for Microsoft servers, make sure you select a site root relative path. Note: Even if using SSI on a Unix server, site root relative paths are usually the better choice. -Dreamweaver will insert an Include comment in your code. Note: If you do not see the above Properties inspector view, you will see a Refresh button. Click it to refresh Code View. -Select the Virtual Type radio button. Dreameaver will ajust the path for you. -In the Preview in Browser category, check the Options box to Preview using temporary file. Note: Even if you manage your own server, your hosting company or server admin should be able to set this up for you.